Following an absolutely stellar dinner at Benu the previous night, we made the trek to Corey Lee's old stomping grounds: The French Laundry, helmed these days by Chef Tim Hollingsworth. 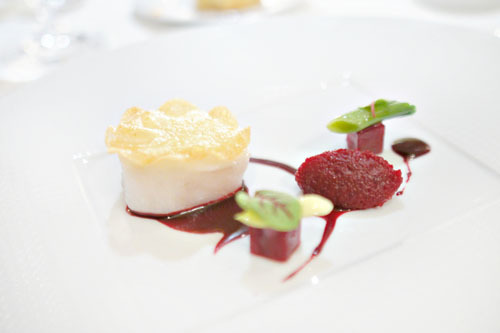 Though the standard French Laundry menu goes for $270, service included, the price rises to $350 a head if you partake in the private dining room as we did. 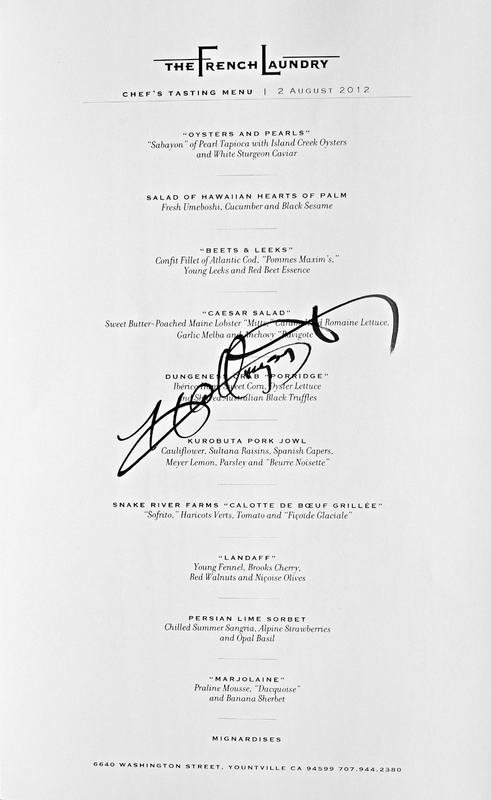 In addition, we added on a wine pairing at $250pp, as well as a supplemental truffle course at a hefty $75 a pop. Click for larger versions. 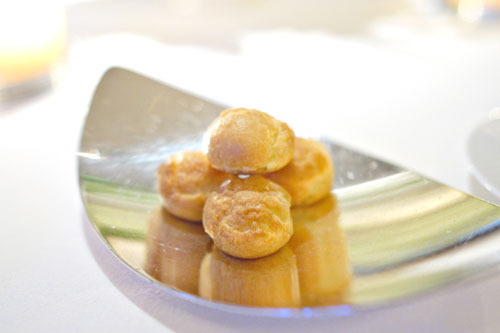 As always, we began with some gougères of Gruyère: utterly creamy, crisp, cheesy little bites that conveyed a simple, satisfying savoriness that one of my dining companions likened to that of Goldfish crackers! 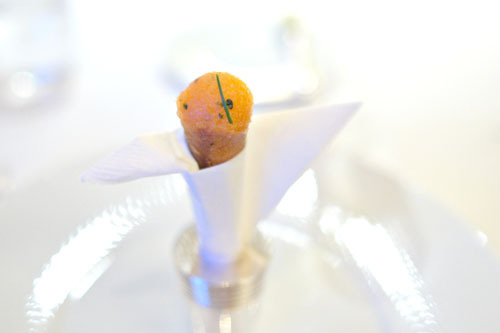 Next up was The French Laundry's famous cornets, comprised of salmon tartar, red onion crème fraîche, and chive, all rolled in a black sesame tuile. They were as tasty as always, with the fish playing superbly against the lush, tangy crème, all while the tuile provided a deft undercurrent of nuttiness and a well-placed bit of crunch. 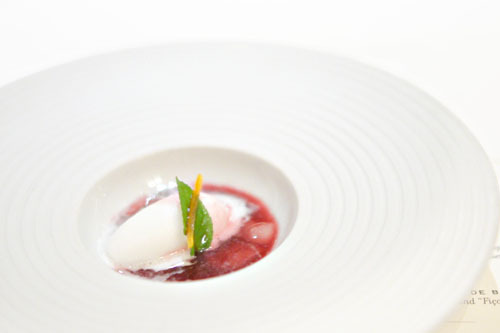 If any dish deserves to be called The French Laundry's signature, then "Oysters & Pearls" would certainly be it. 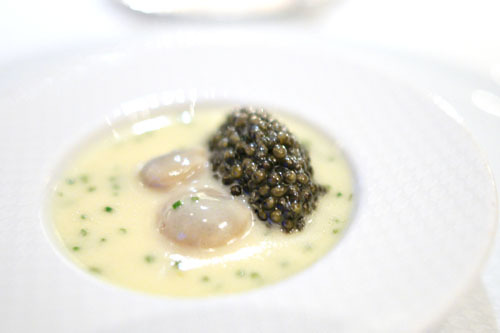 We had here a duo of trimmed oysters, uncommonly luxurious and buttery in character, with a soft, subtle brine that commingled wonderfully with the unabashed saltiness of the caviar. At the same time, a sabayon of tapioca served as the perfect temper to the course, counterbalancing the other elements both in terms of taste and texture. A perfected dish, and interestingly, one that I find almost comforting and home-y after having it so many times. 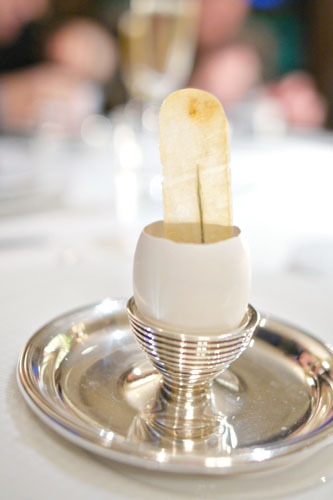 An off-menu, but oft-served course was composed of egg custard, white truffle, black truffle ragout, and a chive-embedded potato chip. Not surprisingly, we found this rather tasty, with the deep, earthy veil of truffle melding wonderfully with the mild, eggy custard, while the chip did a nice job in mixing things up texturally. 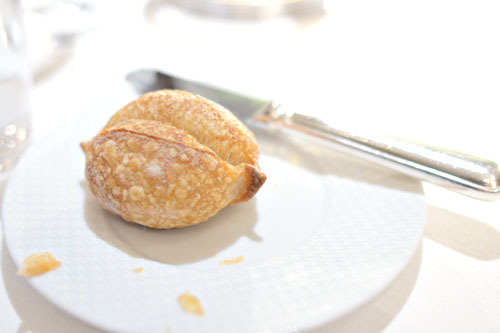 Bouchon Bakery bread service, once again, kicked off with a warm pan au lait, served with unsalted butter from Andante Dairy and a Thomas Keller-exclusive salted butter from Vermont's Diane Sinclair. 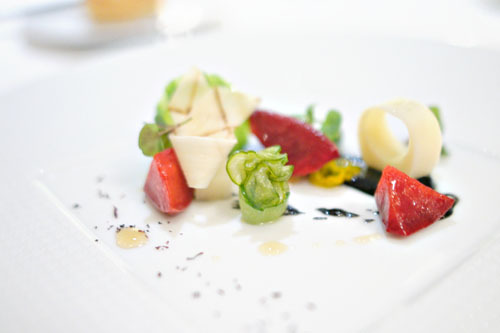 Unfortunately I've never counted myself a fan of hearts of palm, but the presentation here was certainly palatable. The soft, vegetal essence of the palm was proudly displayed, brazenly contrasted against the salty, piquant pickled plum, while the sesame added an enveloping earthiness that actually tied everything together quite well. 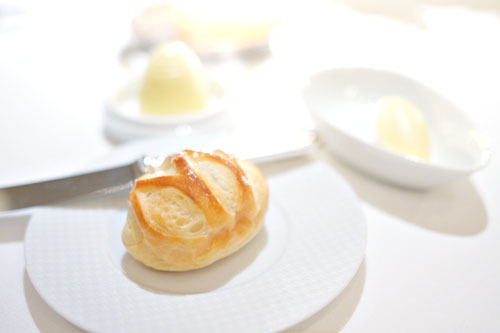 A puck-shaped brioche was nicely flaky, with an almost croissant-like consistency that I enjoyed. Moving on now, the cod here was spot on: soft, dense, and flaky in consistency, with a mild taste that actually went surprisingly well with the sweetness of the beet. Meanwhile, the leeks provided a touch of countervailing astringency to things, but my favorite item was actually the pomme, with its mouth-watering salty, savory flair and wonderful crispness (we cracked its top crème brûlée style). The last of three breads was a sourdough, a prototypical example of style. 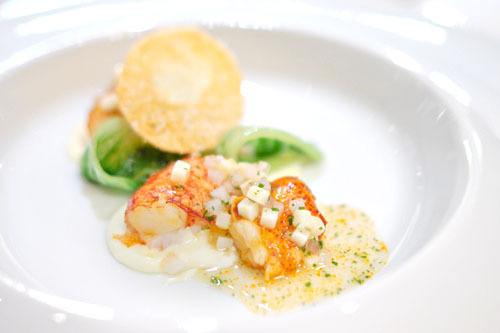 4: "CAESAR SALAD" | Sweet Butter-Poached Maine Lobster "Mitts," Caramelized Romaine Lettuce, Garlic Melba and Anchovy "Ravigote"
Hollingsworth's riff on the classic Caesar salad was one of the highlights of the meal. The "mitts" were superb, the best I've ever had in fact, with a wonderfully spongy consistency and briny sweetness that transitioned beautifully to the savory weight of the Parmesan. The ravigote, meanwhile, provided a delightful offsetting piquancy to the dish, and I quite appreciated the refreshing crunch of the lettuce as well. This porridge represented the $75 truffle supplement to the menu, but unfortunately, it was the weakest course of the evening. 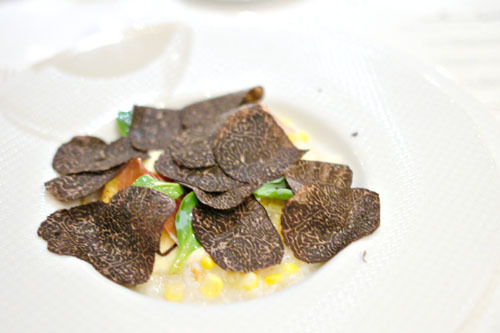 The kernels of corn were quite nice: crisp and sweet, pairing very well with the truffle. 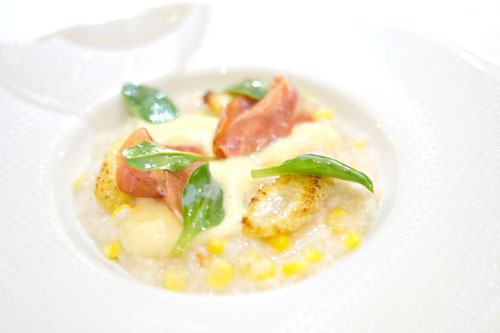 I also was fond of the saltiness imparted by the ham, but found the salinity of the oyster lettuce a bit too jarring. My biggest concern, though, was the lack of crab character in the dish. It was almost as if they forgot to add the ingredient at all (a sentiment shared by most all of my dining companions). 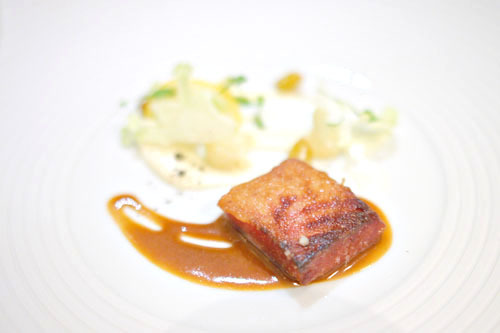 6: KUROBUTA PORK JOWL | Cauliflower, Sultana Raisins, Spanish Capers, Meyer Lemon, Parsley and "Beurre Noisette"
Fortunately, the kitchen bounced back with a lovely dish of Kurobuta jowl. The pork itself was pretty stellar: supple yet satisfying in texture, with an offsetting, bitter char and boatloads of pork-y savor. It was as pure of an expression of porcine goodness as you can get, with a tremendous gravity that was adroitly balanced by the meat's various accoutrements, the citrus-y overtones in the dish in particular. 7: SNAKE RIVER FARMS "CALOTTE DE BŒUF GRILLÉE" | "Sofrito," Haricots Verts, Tomato and "Fiçoïde Glaciale"
Our final savory course of the meal was this gorgeous rib eye cap. 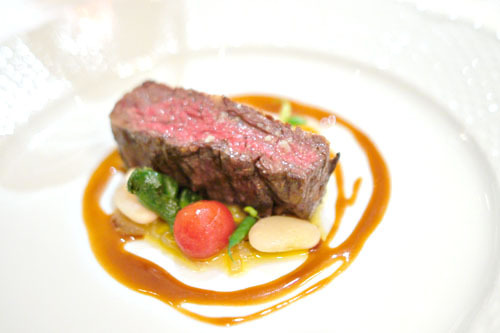 The meat was cooked in flawless fashion, with a wonderfully crisp, savory crust leading to a tender, succulent interior that really conveyed the heady, inherent character of the beef. The ribeye easily stood on its own merits, but its accompanying array of veggies was on point as well, providing crisp, refreshing points of levity to the dish. Overall, marvelous--one of the best cuts of steak that I've had in a while. 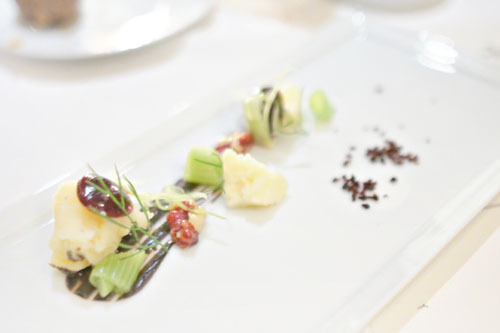 The cheese course featured Landaff, a cow's milk varietal from New Hampshire. It was a mild, easy-eating cheese, making it a suitable stage on which the other ingredients could really make themselves known. The cherry was key here, its sweet and tart flavors forming a fitting foil to the astringent, puckering smack of fennel. Pre-dessert comprised a delightfully sour lime sorbet, its kick-in-the-pants tartness duly counteracted by the sugary sangria and the bright, minty overtones from the basil. 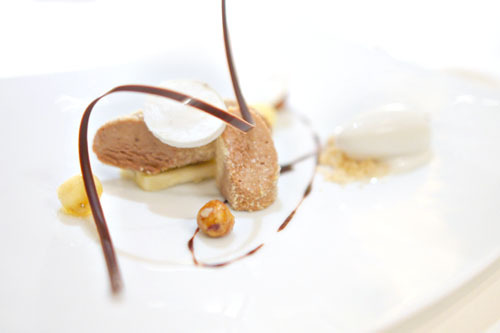 Dessert proper riffed on the classic French dacquoise, which is basically a cake of almond and hazelnut meringues. It was absolutely lovely, with an eminently balanced combination of chocolate and nutty flavors that played wonderfully off of the sweetness of the banana. Great textures, too. 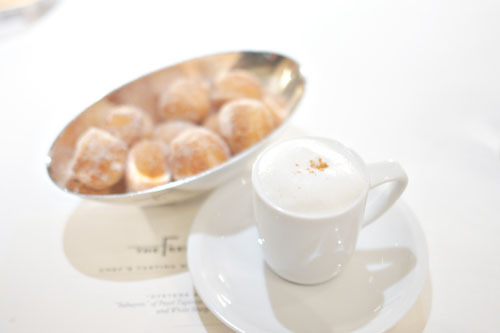 Our parade of post-dessert treats began with the restaurant's signature "Coffee and Doughnuts:" beignets accompanied by a demitasse of espresso ice cream semifreddo. 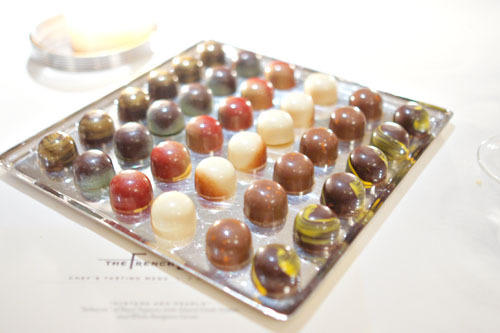 An impressive platter of chocolates arrived next. Varieties included passion fruit, hazelnut, white chocolate-coconut, PB&J, mint, and salted caramel. 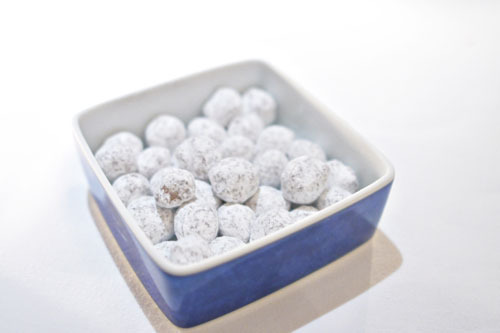 Finishing things off was a bowl of caramelized macadamias. They were excellent, with a wonderful crunchiness and a great mix of saccharine and nutty flavors. Shortbread cookies to take away. Note the new metal tin, a recent addition. This was a very solid meal, and the courses were mostly delicious, but it didn't quite live up to the expectations that I had for the restaurant. In fact, I'm sad to say that it was probably my weakest meal so far here. Not only did we have the misstep with the porridge, but, despite a few standout dishes, the courses in general lacked a certain verve and vitality that I've come to expect. Compared with meals at the likes of Benu or even Sons & Daughters on the nights leading up to this dinner, the food seemed somewhat staid, as if the kitchen has gotten a bit too set in their ways. I really hope that's not the case, but I do feel that some evolution is called for, lest the Laundry get left behind. When you casually drop almost $1,000 (including your course, wine, truffles and tip) how can you not be disappointed? How can it live up to that price point? huge disappointment considering the competition nipping at its feet. Good write-up. I would agree with ~80% of your assessment. 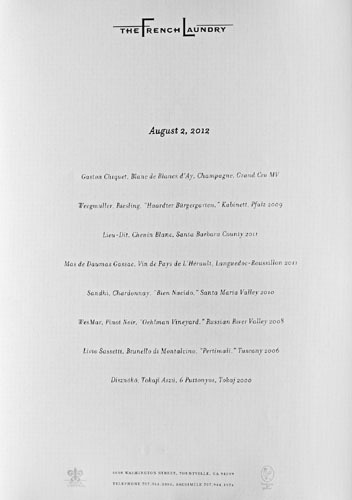 Foodwise, I thought French Laundry disappointed (Hollingsworth was also the chef on our visit). 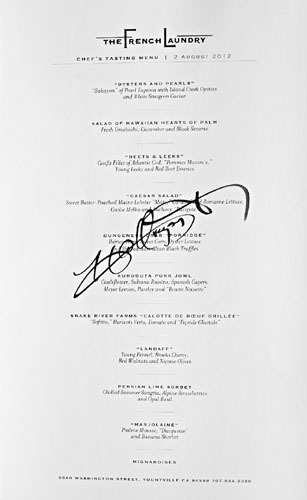 The best dishes were Keller's signature dishes. If you're a foodie, I still find it to be the most important restaurant on the West Coast. And would recommend people experience a meal here if you want to splurge. Regarding cost, I'm not sure why so many people are offered by the cost of your meals. I think it's a matter of insecurity between the haves and the have-nots. And when I spend a lot on a meal, I'm more concerned with the food and the experience. I don't think about the cost too much. Also, we went wine tasting in Napa this past weekend. Went back to Meadowood. You may want to check it out again. They remodeled, re-tooled the menu and added a kitchen table seating four. Two gripes, one the food was a little too light in flavor as the meal progressed (similar to FL on my visit) and the kitchen table is overpriced at $500pp. I think $300 to $350 is more appropriate. We didn't get anything different from the rest of the dining room. Anon: It wasn't nearly $1000pp, but I hear your point. Actually, I have had meals in a similar price range that've managed not to disappoint. Evan: Actually, I think the competition has not only caught up, but surpassed it. Waleed: Indeed. It's still a "must visit" type of restaurant, and is definitely worth going to at least once in your foodie life. Thanks for the update on Meadowood. I'm intrigued by the new $500 menu I keep hearing about, but it's disheartening to learn that you didn't get anything special at the counter. I also completely agree, though I only spent $500 per person and it was my first experience, I was honestly very disappointed. 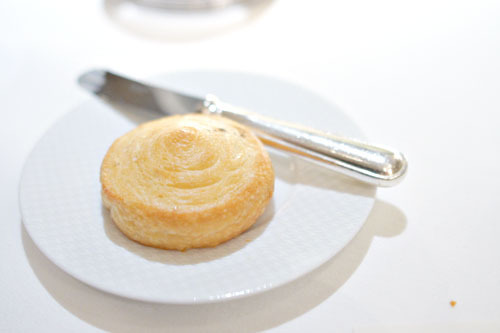 Having looked up to French Laundry as the beacon of restaurants and Thomas Keller as THE chef, I felt that I ate the cookbook and nothing, but one new dessert, was memorable. I must say that everything was executed very well, but just not amazing. Oysters and Pearls is everything it is said to be and lives up to its hype and glory. It was amazing. 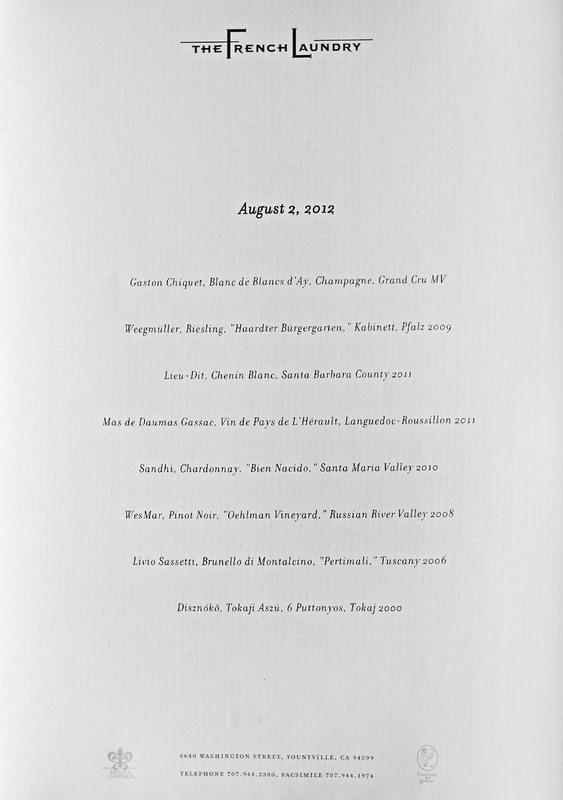 We are going to napa this summer and plan to go to French Laundry. My wife and I are definitive high end restaurant fanatics and so are my nephew and his wife. The rest of us run the gamut from will definitely enjoy the experience but the price may be high for them to I'm not sure some will be able to come to grips with the cost vs the food no matter how wonderful. It will be interesting that's for sure and I can not wait. We too were disappointed -- went just this Friday night. Most of the execution was outstanding -- though one dish with yams and kale just didn't work at all. But several dishes fell flat. And unlike our trip to per se earlier this century, there was little sense of excitement or whimsy -- except in the deserts, which were at the top of their class. We too came away a bit sad that it did not live up to expectations or hopes. Hello, Kevin, I don't know if you will respond to this -- we're now in 2015, but I only just found and began reading your site; and even though I live in Canada, and will likely never go to the restaurants you write about, I am totally fascinated by how you write about your food experiences, along with the photos you provide. 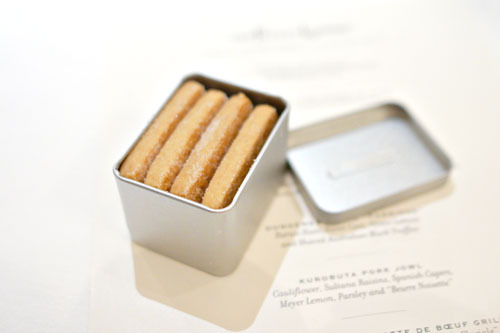 My first read was of your holiday tasting menu at Spago this past Dec, and I had always wondered what a "tasting menu" actually was, whenever I'd hear that. Now I know! Very interesting. I do, however, wonder to myself if a man, especially, comes away from a tasting menu "satisfied", or whether he doesn't go to bed hungry! Prettyyy - prettyyy - prettyyy small portions, I must say! Have you, or have you not, gone to In-and-Out on the way home from one of these babies? I kid, but maybe I'm not wrong . . . I tried to find out on your site how you came to do what you do, and are such a good food writer/reviewer (or, would that, in fact, be "food critic"? Hard to know if times have changed re the job title). You appear to be fairly young (perhaps not even 30? ), yet, know SO MUCH about all these different foods, and how they should taste, etc. -- but you must get that a lot, about your youthful appearance. I'm just curious about it all. Furthermore, I thought you MUST be a mean chef/cook yourself to know what you like and write so well about it, but I believe I read somewhere here, that you wish you could be better. So, then . . . how DID you come to write so well on this subject? Just good ol' life experience? College / university? Just one more item: I'm so curious how a restaurant came to have the word "Laundry" in its name? I'll google it up, but maybe I won't find the same answer that you could supply. You seem to know so much beyond your years in this area. Now: you DO make a living at this, correct? It's not just a hobby to have a blog, like some people do for various things, right? You put too much work into it, ie, photos, for this not to be a job/career! Thank you in advance if you are able to reply to all my nosiness, lol!